Home » Blog » Bake Bright Grease Proof Liners – See the Difference! Bake Bright Grease Proof Liners – See the Difference! 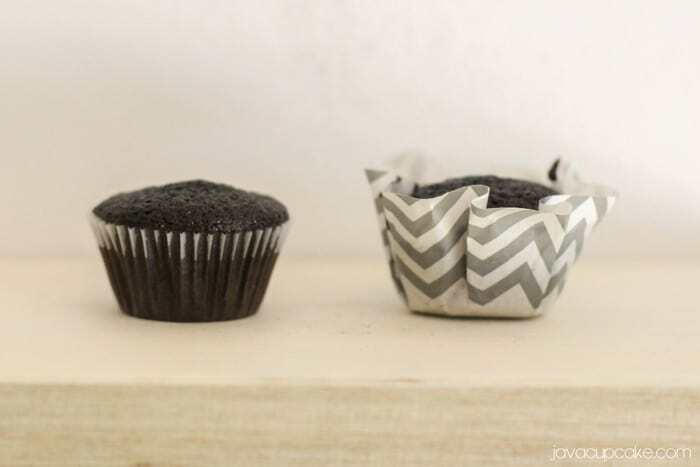 Why settle for cupcake liners that allow the oil and grease of your cupcakes to soak through? Why settle for a beautiful cupcake liner that you can’t enjoy after you bake in it because the design has disappeared? You don’t have to settle any more! 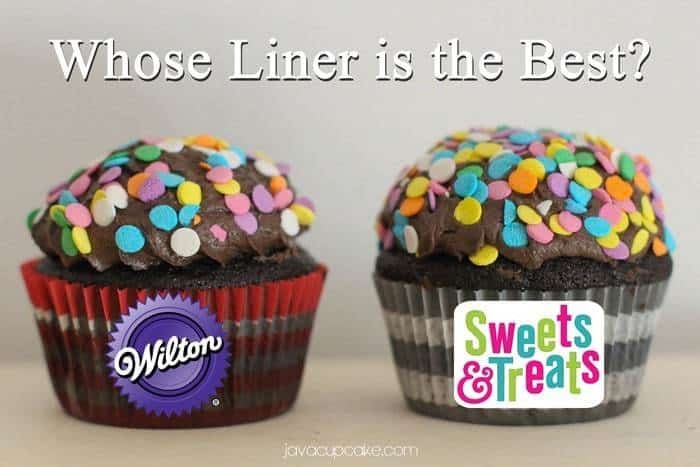 I have tested hundreds of liners over the last 6 years of baking cupcakes and I have come to several conclusions. Not all cupcake liners are made the same! The past weekend I made my rich dark chocolate cake in Wilton cupcake liners and in Sweets & Treats Boutique liners. I wanted to see the difference side by side and really compare the pros and cons of the two liners. The Wilton cupcake liners come in hundreds of colors and patterns for all holidays and occasions. They are sold in almost every grocery store, craft store and baking supply store. 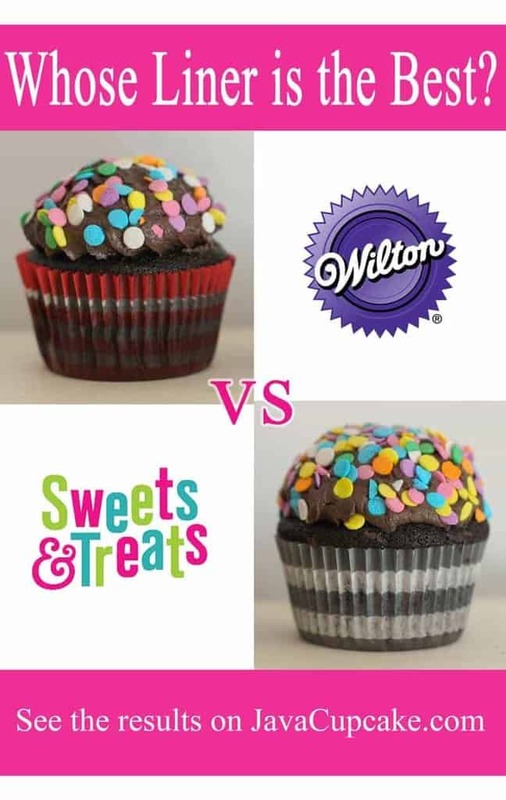 The Wilton cupcake liners are NOT grease-proof. The grease/oils from the cake seep through the paper making the outside greasy and messy. The color and design of the liners do not stay bright and/or visible when baking a dark color cake batter because of the oils that have seeped through the paper. The Sweets & Treats Boutique cupcake liners ARE grease-proof. When baking dark colored cake, these liners keep their color and pattern with little to no oil soaking through the paper. The STB liners come in a large variety of trendy patterns and colors. These liners are priced reasonably for the amazing value of the product. The STB liners do not come in many floral or holiday patterns. (This is just my personal preference – although it doesn’t take away from the awesomeness of the product. I’d just like to see some cute snowflakes at winter or eggs at Easter, etc). 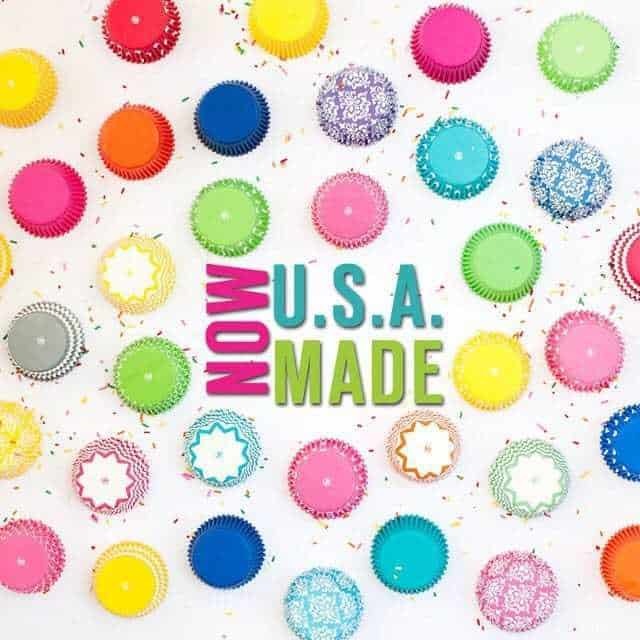 Personally, when I purchase cupcake liners that have colors or patterns on them it’s for a reason – to coordinate with the theme of the cupcake and/or party they are for. I hate spending money on a product that is useless. And that’s how I feel the Wilton liners are… useless. You can see the difference in the photo above. The Wilton liner on the left is wet from grease and has not maintained it’s color or pattern. However, the Sweets & Treats Boutique liner is almost completely dry and it’s color is bright! Why would you ever want to bake your cupcake in anything other than STB after seeing this? I met the owner of Sweets & Treats Boutique, Shannon, online a few years ago through a fellow baking blogger and we instantly became friends. Shannon has sent me so many of her liners over the years to try that I’m pretty much stocked for life, but let me reassure you that our friendship does not change the fact that I think her liners are better than any other on the market. Shannon has a passion for her business and she works every day to make it better. Shannon saw how dark my chocolate cake baked in her liners and she was determined to come up with a product even better than what she already had. 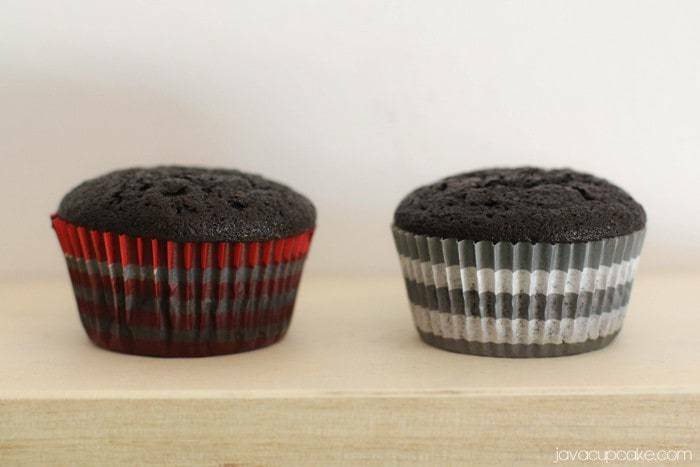 A cupcake liner that could stand up to even my chocolate cupcake recipe. And guess what… Shannon did it. The cupcake on the left is baked in a mini Wilton cupcake liner and on the right is the new and improved grease proof bake bright liner from Sweets & Treats Boutique. ZERO grease comes through this paper leaving 100% of the color and design visible. How amazing is that? Sweets & Treats Boutique Bake Bright Grease Proof Liners time and time again prove to be the best in the industry at keeping their shape and color, even with the toughest of batters like my chocolate cake! And one more awesome thing… all the new liners in the new #BakeBright Grease Proof liners will be made 100% in the USA! How amazing is that!? Sweets & Treats Boutique provided me with the mini cupcake liners to test but all the opinions are my own. A good cupcake paper is just as important as a good cupcake! Recently am making a new cupcake recipe a week… ok they are bar cupcakes but I would love to win this to add something extra to the new cupcakes! I always use Wilton. Cute, affordable and work great! Love the ‘surprise’ box of 300 liners! Great gift for bakers. I like the Black and White Dot Cupcake Liners. My favorite liners from STB are the red dot liners! I absolutely love her liners!!!! I love the Lime Quatrefoil cupcake liners! I love the box of assorted cupcake liners. Such great designs! I’ve dealt with greasy liners for wayyy too long! So great to finally see a great solution! AND pretty? AND made in the US? Perfect!! I love them all! I am torn for a favorite between the Aqua Dot liner and the Lime Chevron…. Wow, they have a great selection! I love them all, especially the striped ones. However, what I love best is the liner assortment box…what a great gift that wouldl be! I love the Aqua polka dot cupcake liners. I love the pink & lime quatrefoil! I am a sucker for all things polka dotted, and their blue damask is gorgeous! How beautiful are these liners?!! I am in love with the Damask Cupcake Liners in Aqua!! Everything is beautiful, but I like the red damask liners the best!! Thanks for detailed comparison and information – it was super helpful! I’ll definitely be looking into Sweet & Treats Boutique liners! OMG! The options are limitless. I’m a sucker for anything that is polka-dot! I love the vibrant colors…and to know that they are grease-proof….be still my beating heart!!! I’m kind of the plain Jane…I like the black and white cupcake liners. The checkered ones and the black chevron. Love liners that keep their color! I love to use really colorful cupcake liners. I get really upset when the liners lose their color. I love the damask, chevron, & polka dots the best I think. All the color choices are awesome! Can’t wait to try these!! If you are going to all the trouble to make fantastic, delicious cupcakes you must have the cutest wrappers ever!!!! Just received my first order of BakeBright liners. Have you or anyone frozen baked cupcakes in them? Need to bake 300 for a wedding. I realize this article is from 2015 but I just used the link to visit Sweets & Treats to find liners and every single one is sold out. Apparently more are in production, delivery date tba… Hope so!